QED uPlay Stream review | What Hi-Fi? There aren’t many dedicated music streamers for £150 – the cheapest of last year’s award-winners was £400 – so we’re chuffed that QED has pitched the uPlay Stream at such an aggressive price. This streamer works over wi-fi or ethernet to stream music from any DLNA network-attached storage device to your hi-fi system. It can also access files from cloud storage (SkyDrive and Dropbox) accounts or Windows Media Player (11 or higher). It supports all the common file formats, adding Apple Lossless Audio to its compatibility list too, and copes with high-res files up to 24-bit/96kHz. Left off the inventory is 24-bit/192kHz, but that’s not a deal breaker for us at this price. Around the back of the device things look pretty bare, though that’s probably to be expected from something that can fit in the palm of your hand. What’s handy to know is that the only analogue output is a 3.5mm jack plug. QED provides a 3.5mm-to-stereo phono lead but it’s only 65cm long. Though this might prove restrictive with a standard box-sized streamer, there shouldn’t be a problem finding somewhere near your amp for the tiny QED to perch. If there is, you can always buy a longer lead. Wireless functionality also means that the ethernet cable running between the streamer and router isn’t necessary once set-up is achieved, though choosing to keep a wired connection should give more stable results. 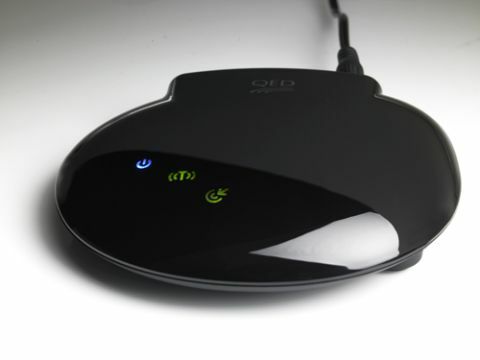 In line with its UFO shape, the QED is all flashy lights. There are no buttons to use, or a display in sight. Much like an internet router, once you’ve gone through the simple set-up steps, the device can be tucked away and forgotten about. You will, though, need to have the dedicated app – the QED uPlay Stream – handy. It’s here that all the controls can be found. The free app is Android and Apple compatible, and can be downloaded on a PC or MAC (providing the software is Windows XP or newer, OSX 10.7 or later) for streaming files from a computer. It is straightforward enough to use. Select whether you want the sound to output from the uPlay Stream or the mobile device you’re using, and you’re good to go. Usability is a no-brainer and response time is quicker than some apps we’ve tested. The most important controls are all in place and it has some useful functions to complement simple playback operations; you can create playlists and queue, repeat and shuffle music. Changing volume and searching tracks with neat slider buttons is a nice touch where handling is concerned too. Despite all that, the user experience is nothing special. Browsing files and folders in the listed format isn’t the most seamless affair, especially if your library is, like ours, vast. The search bar helps somewhat, but we prefer the grid format – or at least the choice of an alternative display. Pressing the ‘Back’ button repeatedly to steer through folders is also a bit tedious. A lack of access to file information other than song, artist and album name also made testing different formats a bit of a memory game. By and large though, it’s ample enough for a one-product app. It does what you’ll need it to do, even if it doesn’t do it particularly gracefully. If QED expands its range of wireless products, we’d expect more flesh on the skeleton structure of this one come future firmware updates. The uPlay Stream can also be used as a multi-room system. Buy up to eight of them to connect with hi-fi equipment in different rooms and they can all be controlled on one device, and renamed for easier identification, via the app. If, however, you want to play different music on, say, your lounge device or kitchen device, you’d need another mobile or tablet to do so. Also be warned that the company recommends using a maximum of six streamers to ‘ensure stability and performance’. The performance here is enjoyable enough to make you want to click your fingers to Daft Punk ft. Pharrell Williams’ Get Lucky. A reasonable amount of vocal clarity is on offer, and the midrange is consistently smooth. We flicked through a number of different tracks and generally the uPlay delivered a very listenable sound. Simon and Garfunkel’s The Boxer was easy on the ear, while Alt-J’s Breezeblocks was delivered with reasonable verve. The QED’s adoption of dynamics and pace is fair for the price too. You’d have to spend a great deal more for a more insightful and cohesive elocution. The next-cheapest hi-fi music streamer we’ve heard, the Pioneer N-50, is £400 (yes, it’s that big of a jump) and has a more clean, controlled sound. Its punchy dynamics, enveloping soundstage and grasp of detail generally make for a more compelling listen. But then you’d expect that. The uPlay Stream’s sound is still pleasant, and more than satisfying for the price. You shouldn’t expect it to glisten in the company of much pricier high-end gear, but coupled with similarly matched equipment such as the Rotel RA-04 (£250) amp and/or Q Acoustics 2020i (£165) speakers, it’ll work just fine. Once again, QED has proved that connecting to your music – wires or no wires – doesn’t have to break the bank. The uPlay Stream is nothing short of a feat for the company, making streaming music possible at a fraction of the price than ever before. So, although it doesn’t match the sound and build of more expensive music streamers, you’d have to double your spend (at least) for that luxury, though if you can stretch to something like, say, the Pioneer N-50 or the Marantz NA7004 (£430), we’d figure it would be worth it. At the moment, nothing masters the middle ground. So if you’re after a cheap and straightforward way to stream a range of files through your home cinema or audio system without sacrificing a decent sound and good features, the uPlay Stream is a real steal and could be one of your most useful purchases this year.